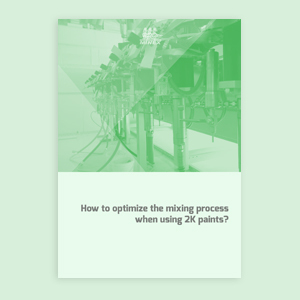 Free Whitepaper: How to optimize the mixing process when using 2K paints? Choosing the appropriate 2K paint mixing system is crucial when willing to minimize the cost associated to unnecessary waste of material or the one related to the repair works needed in case the mixing ratio and procedure are not entirely respected as recommended by each paint producer in part. Which are the advantages of choosing 2K paints instead of 1K ones? How to choose the appropriate mixing way of the 2 components, based on the type of paint you intend to use? How each mixing method works?